Tiny Bermuda will be competing in the Gold Cup for the first time in their history after beating the Dominican Republic 3-1 to seal their spot in the competition. Goals from Zeiko Lewis, Nahki Wells and Justin Donawa saw the island nation, with a population of just over 70,000, stun their higher ranked opponents in a winner-takes-all affair. The Gold Cup will be played by 16 teams this year instead of the usual 12, and that’s allowed two new debutants- Bermuda and Guyana, who beat Belize 2-1. There could’ve been an even bigger qualifying story in the form of Montserrat (pop 5,000 and ranked 200th in the world), but they were cruelly denied on goal difference as a result of Nicaragua’s win over Barbados. 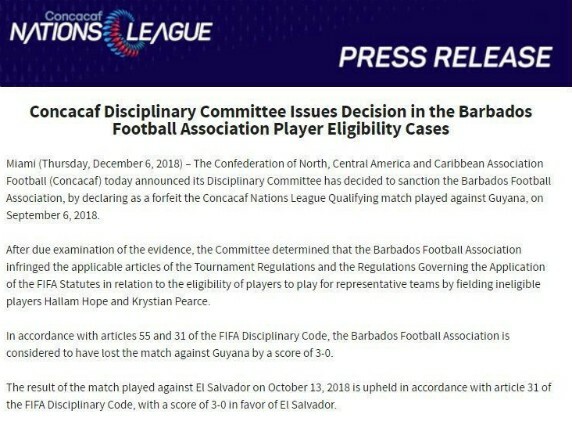 Montserrat would’ve even made it had Barbados’ 2-2 draw against Guyana not been converted into a 3-0 win for the latter owing to the former fielding ineligible players in that fixture. One of those two ineligible players was Hallam Hope, who scored a cheeky goal against Notts County earlier this month. The groups for Copa Oro 2019 will be announced on 10 April in Los Angeles.